Thelonious Monk (1917 - 1982) was a US-American African-American jazz musician, who became known as a pianist and composer. He was co-founder of Bebop alongside Charlie Parker, Dizzy Gillespie, Charlie Christian and Kenny Clarke. 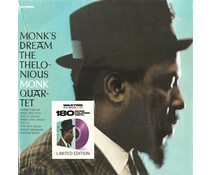 With his idiosyncratic piano style and his distinctive compositions Monk is considered one of the great individualists and major innovators of modern jazz. 2016 EU reissue on 180g LP =This 1956album surely a 'Top 10' in the history of jazz recordings,includes such classic Monk fare as "Round About Midnight," "Off Minor," "Ruby My Dear," "Thelonious" and "Well You Needn’t" among others.